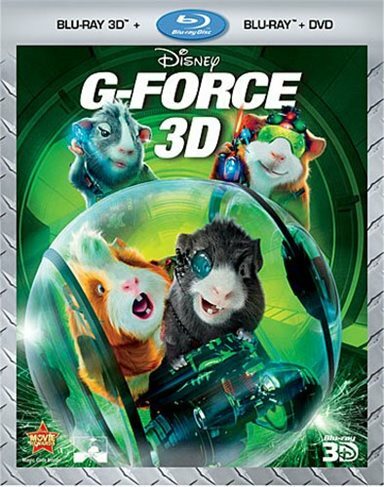 On November 8, Walt Disney Home Entertainment is releasing another one of their 3D films, this time, G-Force, which was released originally in 3D. G-Force is the story of a team of very special guinea pigs, who, with the aid of technology, can talk. These guinea pigs have been trained by an FBI Agent to do missions that human agents can't do. The movie begins with the team assigned their first mission – to recover data from a computer. When they fail to get what appears to be the correct information, the FBI disbands the team and the team ends up in a pet store. One by one some of the team is bought by the public, leaving the final team member to escape, and reunite his pals in order to restore their honor. As I mentioned in my original review of the film, the 3D is very well done. However, upon viewing the movie a second time, this time at home, while it doesn't rely solely on the 3D gags that I don't really enjoy, the movie has more than a fair share of them. Those gags I mean are items coming straight at you, the audience, for no real cinematic reason than to "put 3D in your face". In this movie, these times are when they are using CG, such as special wheels that come out of the screen, or when an explosion happens, and some of the debris flies at the audience. So please keep that in mind if you are like me with the 3D. The 3D goes very well with the exceptional digital audio that comes with the Blu-ray – sound that envelops you in certain scenes and truly completes the 3D experience by bringing you into the scene. Screen brightness is also not a problem in general, as this movie was originally filmed for 3D, with minimal post-production 3D. It seems that the issue of screen brightness is mainly with the theater 3D projectors, and not as much for 3D systems that require the use of active shutter glasses. The picture provided by the Blu-ray, both 3D and 2D versions have a very sharp picture, with the full 1080p picture showing fine details that are lost with the DVD version. The 2D Blu-Ray disc also includes bonus features, such as bloopers, deleted scenes, several music videos, and two featurettes: "Blaster's Boot Camp: High Tech G-Force Training" and "G-Force Mastermind: Inspiration Behind the Movie". The 3D combo pack includes the 3D Blu-ray, the 2D Blu-ray, and a DVD copy of the film. It does not include a digital copy of the movie, but since the movie is really good, the lack of this is not enough to bring down my rating of this release. Download G-Force 3D from the iTunes Store in Digial HD. For more information about G-Force visit the FlickDirect Movie Database. Since he was very young, Roger has enjoyed going to the local theatre and seeing a good film on the big screen. Starting with the lines for The Empire Strikes Back, Roger has especially enjoyed the Star Wars franchise, culminating with his attendance at the Washington, D.C. premiere of Star Wars I: The Phantom Menace. He enjoys movie music, especially those from most Disney animated features. Read more reviews and content by Roger Longenbach.